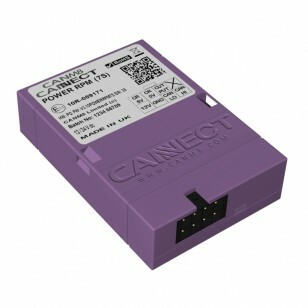 The CANM8 CANNECT POWER RPM (7S) interface is indentical to the "POWER RPM" interface in that it provides an output whenever the vehicle engine speed is greater than 500 RPM but with a 7 second delay after engine running is detected. The output automatically cancels when the engine is switched off. Engine Running > 12v (1A max) when the engine speed has been above 500 RPM for 7 seconds. The CANM8 CANNECT POWER RPM (7S) is an ideal solution for installations of any equipment that requires a delayed engine-running power control. PURPLE > RPM Output : 12v (1A max) when the engine speed has been above 500 RPM for 7 seconds.